Three of the new hydrangeas in their permanent home. The board is Bertie's ramp up into the garage. The growth is impressive for their first year in the ground. Some of them even have flower heads forming. As they continue to grow, they should make a nice flower hedge against the house with plenty of green from spring through fall. I'm really happy with how this worked out. The photo below shows the plants in December 2013 just after I potted them up. Little hydrangea cuttings, rooted and potted, nearly a year and a half ago. We're using the central heating again after a few weeks of not needing it. Temperatures in the past two mornings are down into single digits (that's celcius -- low 40sF). That's a little lower than normal, but it feels cold compared to a week ago. Oh well. It's still April. Last night I dreamed I was driving in snow, a thing I have not done in decades. 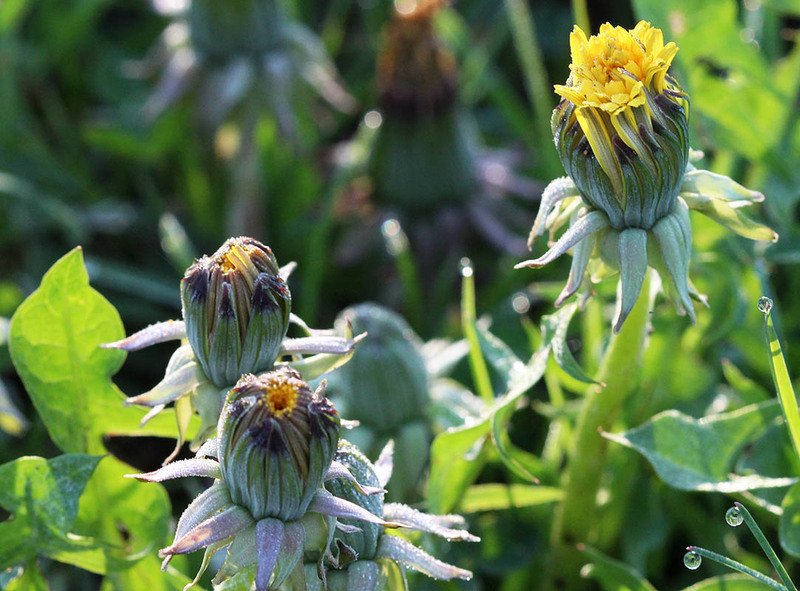 Cool spring weather doesn't seem to slow down the dandelions. On Tuesday I divided my tomato seedlings. Even after tossing a few that were particularly leggy, I still have thirty-five individual plants. I swore I was going to have fewer plants this year. Ha! We're still a few weeks away from planting out in the garden. 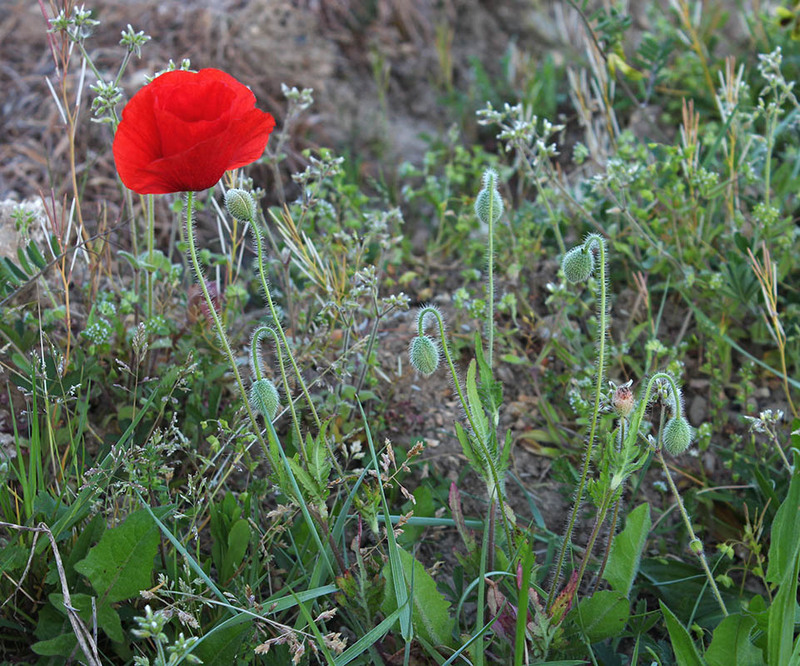 Here is the first coquelicot (poppy) that I've seen this year. It's out in the vineyard, where a few patches pop up here and there every season. Elsewhere, these prolific bloomers will paint entire fields with their bright red color for a few weeks as spring progresses. I hope to see some when we're out and about, and if I'm lucky I'll have the camera with me. A single flower in bloom with at least six more on the way. Temperatures have dipped again to below normal for this time of year. Outdoor work is slowing, but I still managed to plant some seeds (indoors) for zucchini, cucumbers, and several varieties of winter squash. Once they germinate, they'll go into the mini-greenhouse on the deck until it's time to set them out in the garden. That will be some time in mid-May. This year I've noticed that, in our market at least, the asparagus is not as abundant as in past years. I'm talking about the local stuff that's grown not far from here. I bought a bunch on Saturday and the vendor told me that it's been slow growing, and that some days the harvest was good, but on other days there was nothing to pick. And then there were some fields where the asparagus was no good and unsellable. I wonder what it is? A week ago his asparagus was going for €9.50/kilo (about US $4.70/lb); this week it was down to €6.00/kilo (about US $2.95/lb). I'll make this dish a time or two more before the season ends. He also told me that their strawberries, which are also normally abundant now, were slow to flower this year, and he won't have his first berries until next week. There are local strawberries to be found, and I got some on Saturday from another vendor, but my normal supplier is having trouble. I hope it gets better for him. Meanwhile, I made our annual asparagus and ham tarte for Sunday's lunch. 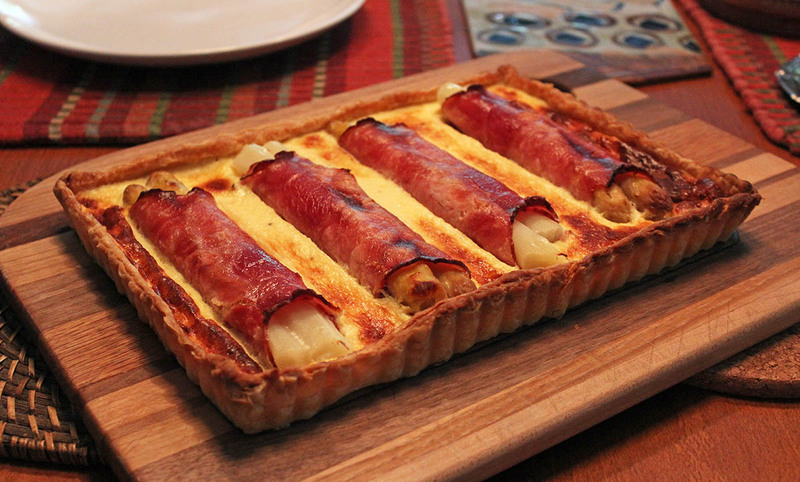 If you don't remember, the white asparagus is peeled and cooked, then wrapped in ham slices, placed in an egg and cheese (parmesan) custard, then baked until done. 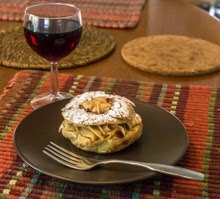 We ate it with pan-fried potatoes. Delicious! 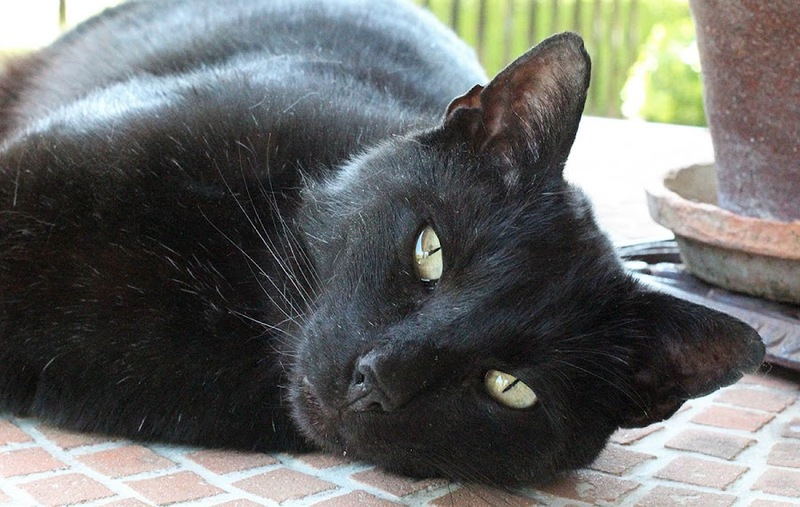 Bert likes to come visit us on the deck in nice weather. 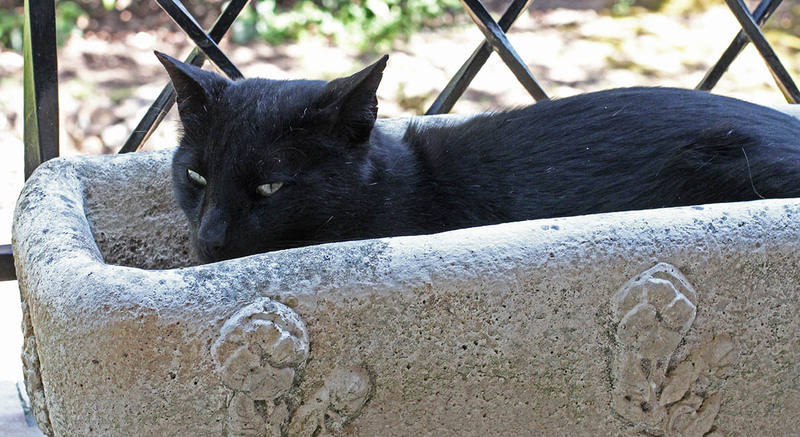 Sometimes he jumps up on my lap, other times he sprawls on the table, and this time he nestled down into one of the empty planter boxes. 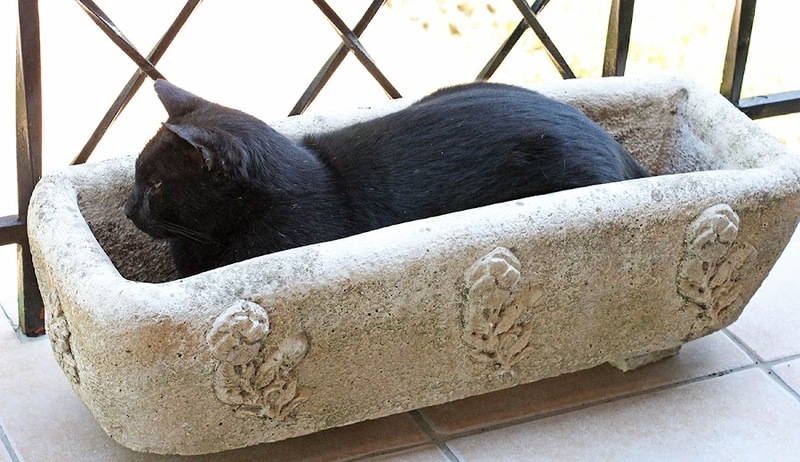 I will soon be putting geraniums in the planters, but in the meantime, Bert thinks that they're spa beds. It's almost like a sarcophagus. He has no idea that cats were once mummified. In the good weather, Bert gets more people time than he does in winter. He'd rather snooze close to us than down in the garage where his bed is. He still spends most mornings on the couch when Ken gets up, but he has to go outside when it's time for Callie's breakfast. Mademoiselle does not tolerate cats. It's too bad, because Bert has no problem with dogs. It's just Callie who won't leave him alone. She was here first, it's her house, and from her point of view, Bert is an intruder who must be chased. Oh well. It's been five years and nothing's changed. Just hanging out on the table top. This week's cover celebrates the upcoming season of summer sports. There will be swimming (world championships in Russia), cycling (le Tour de France), tennis (Roland Garros), rugby (World Cup), and track and field (world championships in Beijing), among the highlights. I know I'll be watching the tennis and the cycling. I'm not really into the cycling per se, but they usually have terrific aerial views of France during the three week race. A sports-filled summer. Just like last year. And the year before that. What not to watch this week. Our tv magazine rates shows and movies using a star system: one star is ok, four stars is best. They use another symbol for really bad movies: the red dot. 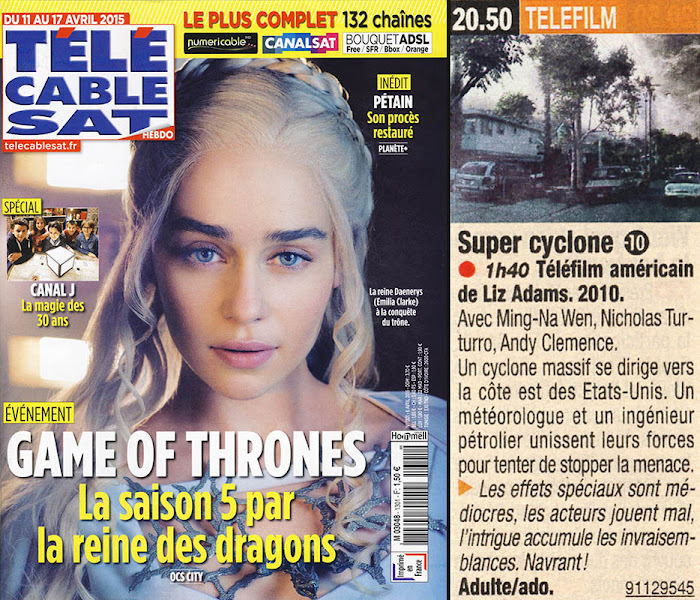 It means "à zapper" (change the channel!). The editors often include comments about the movie that make me laugh. We leave the weather disasters behind this week and move into the realm of alien visitation. This time, it's the Roswell, New Mexcico, mythology, starring Denise Crosby, probably best known for her stint as Tasha Yar on Star Trek: The Next Generation. She knows her space aliens. 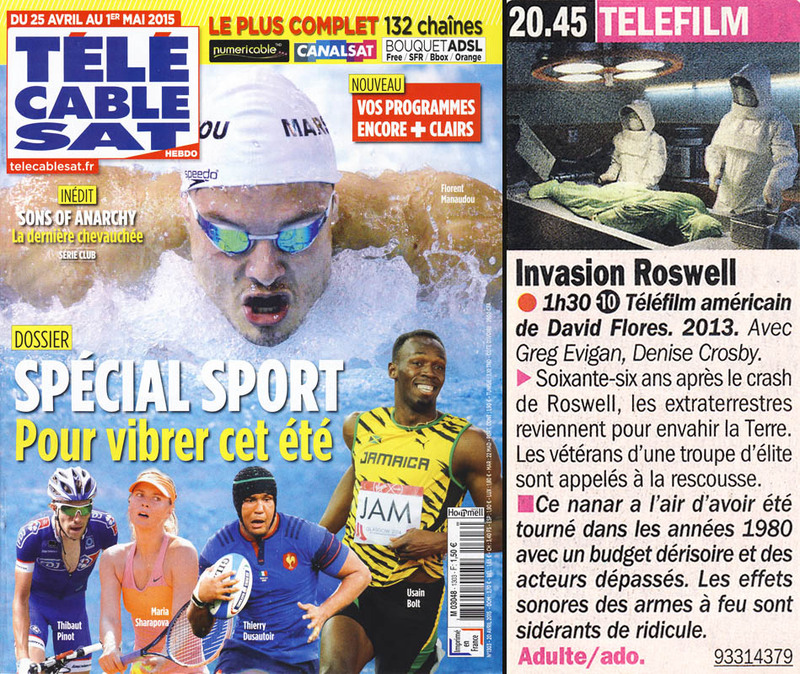 Invasion Roswell. American made-for-tv movie. Directed by David Flores, 2013. With Greg Evigan and Denise Crosby. Sixty-six years after they crashed in Roswell, aliens return to invade Earth. Veterans of an elite force are called to the rescue. ► This flop feels like it was made in the 1980s with a paltry budget and washed-up actors. The sound effects used for the weapons are ridiculously absurd. For adults and children over 10. Two red maple trees tower over the drive at the front of our house. When they're fully leafed out, they filter the morning sun on the house's eastern facade. During summer's warmest days, the dappled light helps keep the living room from heating up too much. In winter, when they're bare, the low sun can shine through. When there is sun. The top of one of the maple trees and its shiny new red leaves, taken from our deck. The apple trees in back are in full blossom right now. We're in an "on" year for the apples and I'm expecting a lot of them. It will be a pain when they start to fall from the trees later this summer and I have to pick them up before I can cut the grass. Most of them go into the compost pile (you can only eat so many apples), and that's good for the garden. Many years ago (in 2006, I think), we planted a fig tree in our back yard. The word "tree" is a stretch. I think it's still less than two feet tall. And it's never really produced any edible figs. I should point out that there are marvelous fig trees all around our area. Huge, productive trees. I don't know why ours is not. One cold winter it froze to the ground and we thought that was the end of it. But it came back from the roots the next spring, so we kept it. I love fresh figs and I'm hoping to get to eat these. However, in the past two years, the tree has started to get bigger. 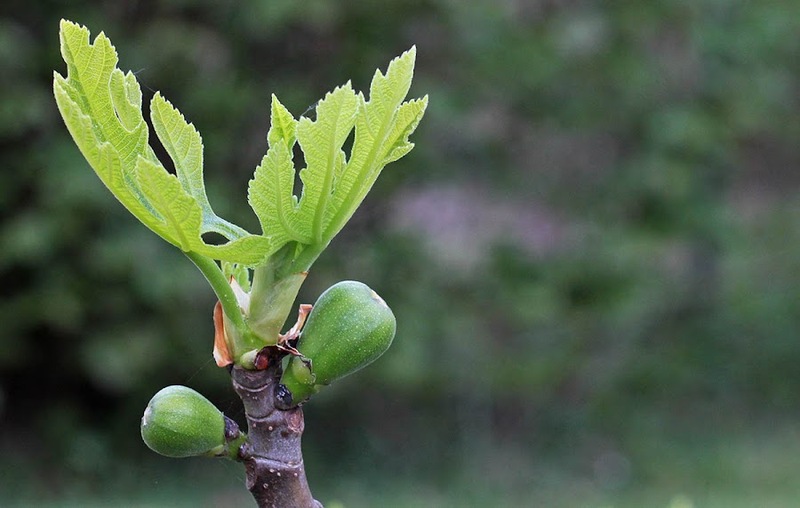 And this year there are about a dozen tiny figs like the two you see in the photo. I'm hoping, against hope, that this is the start of something, if not big, at least a little bigger. 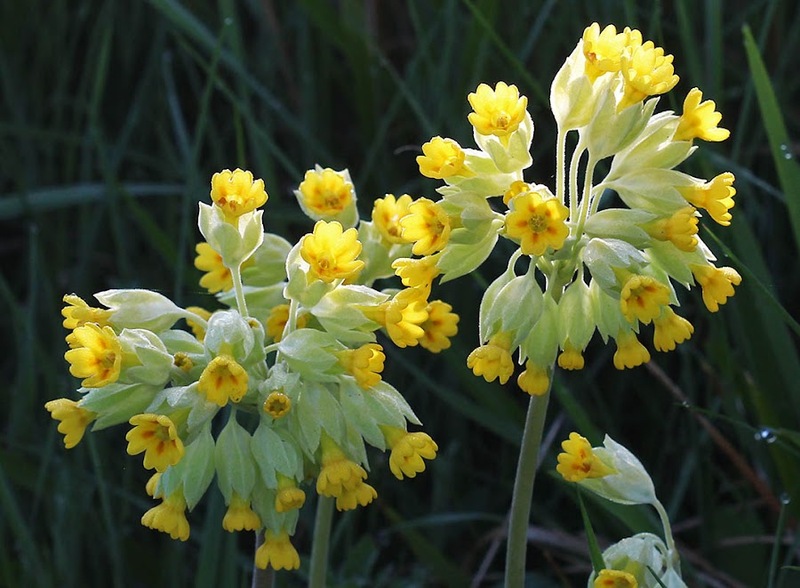 This is prime time for les coucous (cowslips) where we live. They're typical spring wildflowers and proliferate along the vineyard road, especially near areas where water collects or runs. We have a few in our lawn, but they really thrive out in the places that are not cut in spring. Les coucous en pleine floraison. Yellow is the common color for these flowers, but I have seen a few with tinges of orange and even red. The word coucou is also the French word for cuckoo, that bird with the distinctive call that we hear this time of year. The cuckoos are with us from April through June until they move on. They over-winter in southern Africa and southeast Asia. There's an old joke about a guy named Arthur who robs a grocery store. In the process he strangles four of the store's employees and, when he finally opens the register, all he gets away with is a single dollar bill. The headline in the paper reads, "Artie chokes four for a dollar." Rimshot. 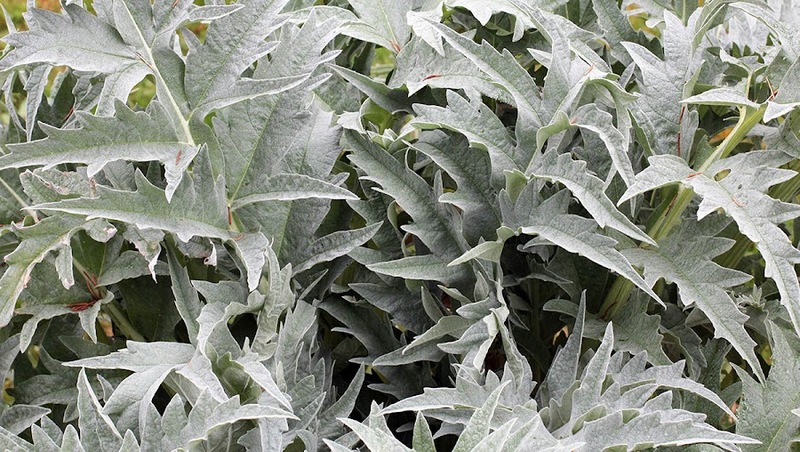 I like the grey-green of the artichoke plants in our garden. There are two left and they seem healthy. You can tell it's an old joke; artichokes are considerably more expensive these days. On Monday I got some gardening done. I weeded the new rhubarb patch (man, those weeds grow fast), planted six strawberry plants, and trimmed the tall grass along the edges of the garden pathway. I noticed yesterday that the cottonwood trees are starting to release their seeds. They almost look like snow flurries, little white puffs floating by on the breeze, slowly, but surely, settling down onto the ground. There will be more as we move through spring. 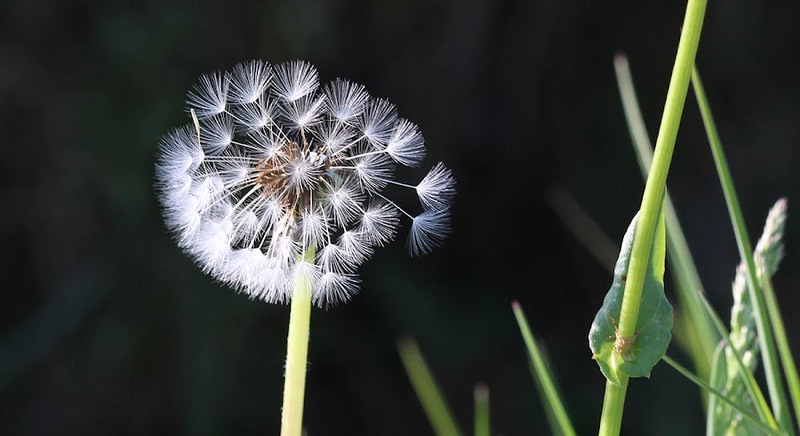 The dandelions are also doing their thing, although I mostly notice the bright yellow of their flowers and not so much the seeds swinging from their tiny parachutes. They are much lower to the ground when they fly and don't seem to go as far. Our lilac bush is flowering now. We're in an "on" year for this variety that flowers only every other year. I've read that lilacs normally flower every year, but that in alternating years the flowers are more abundant (our apple trees do that with apples). But this lilac actually takes every second year off with no blossoms at all. Last year was a bare year, so it's nice to see the flowers again this spring. Purple lilac flowers just starting to open last week. 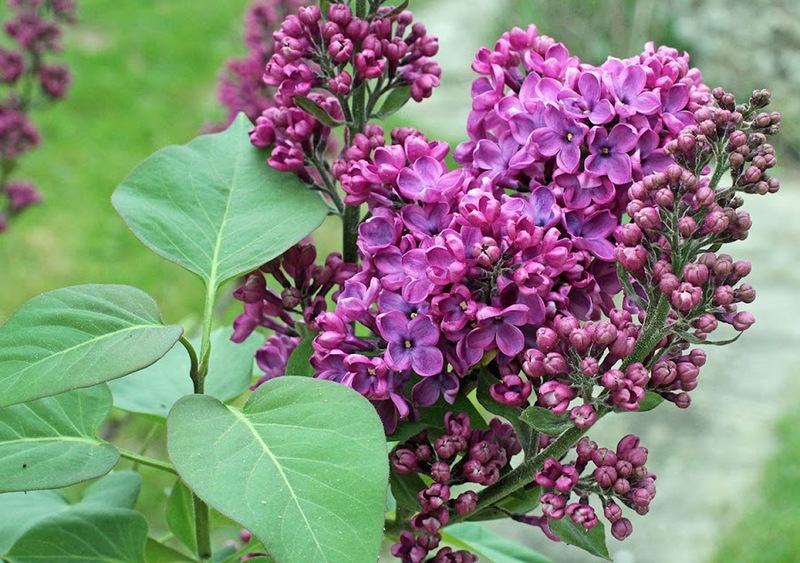 Lilacs are abundant around here, and most of them do flower every year, from what I've seen. Friends of ours recently removed some aging and overgrown plants from part of their yard and I mooched some of the root stock from them. They told me that they had to be careful to remove it all or it would easily come back. Hearing that, I asked if I could take some of the roots home and try to get them to grow in our yard. I came back with four bunches of roots, each with a budding stem attached. I planted them a few weeks ago and now one of them is covered with new leaf buds. I'm still waiting on the others with fingers crossed. 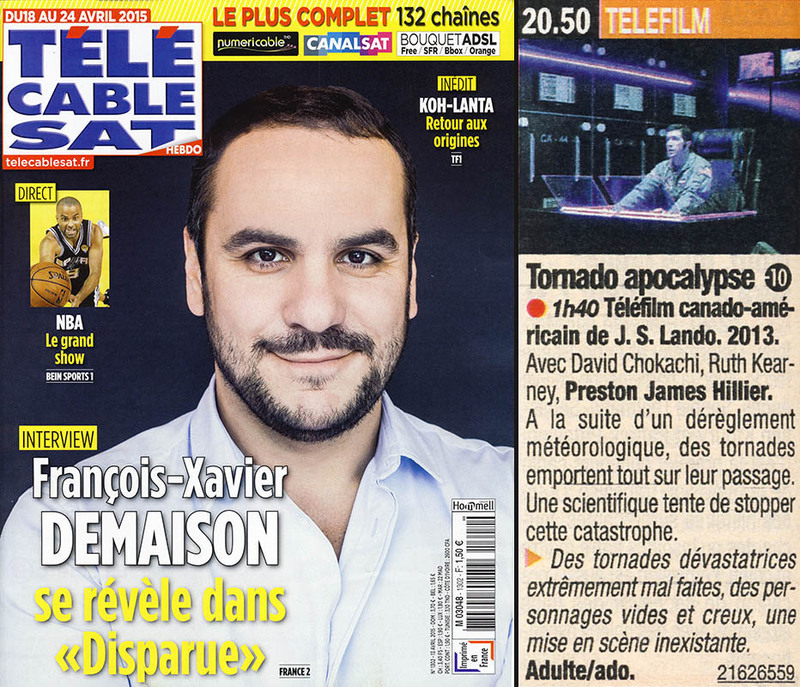 This week's cover features actor François-Xavier Demaison in a new mini-series that starts on Wednesday. To me, the series sounds like a formula cop/mystery/soap opera thing in which a young girl goes missing and everyone's dirty laundry comes out while they search for what happened to her. 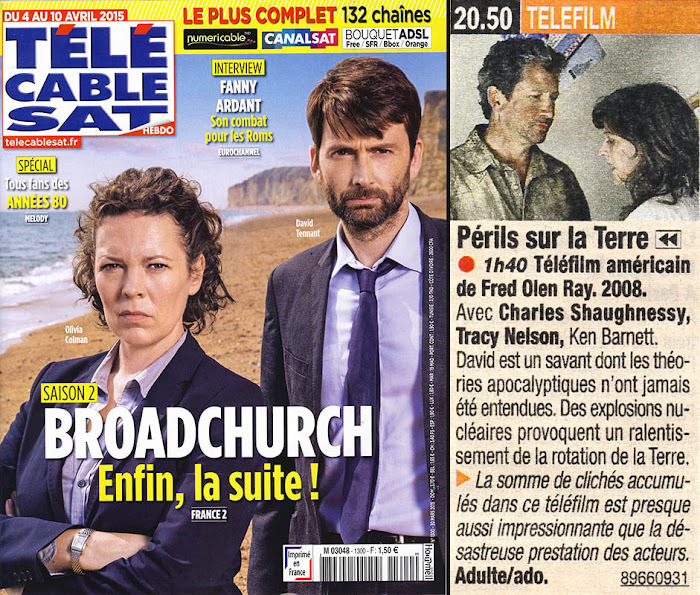 Think "Twin Peaks" or, the one we're watching now, "Broadchurch." NBA playoffs live on the BeIN Sports Network! That's Tony Parker pictured, a French guy who plays in the NBA. Here's another weather disaster. And disaster seems to be the key word. The original title was "Jet Stream," according to the IMDb. Tornado Apocalypse. Canadian/American made-for-tv movie. Directed by J. S. Lando, 2013. With David Chokachi, Ruth Kearny, and Preston James Hillier. Following a weather anomaly, tornados begin sweeping away everything in their paths. A scientist works to end the catastrophe. ► Devastating tornadoes very badly done, characters that are empty and hollow, and lackluster directing. Callie likes to sit (and roll) in the grass when it's been newly cut. She also likes it any other time. Here she is in one of her favorite spots just after chasing down a tennis ball. You can't see it in the photo, but one of the balls is between her paws; the other is on the ground just to the left of her. Callie peeks out from behind the patch of daisies. They're small now, but will grow up to about 3 feet. The forsythia, on the right, is just about done blossoming and the leaves are replacing the flowers now. The prunus, in the middle, is in full flower. On the left is the big apple tree, and its blossoms are just starting to open. Before long, it will be all green leaves. Wednesday was a warm one. I measured just over 27ºC (80ºF) on our deck during the afternoon. That is certainly more like high summer here than the middle of April. Sleeping last night was difficult. With most of the windows open, the sounds of the night seemed amplified. Twice I could hear caterwauling outside and our neighbor yelling, "Fous le camp! (Get out of here! )," presumably at our Bert. When the cat howls, Callie jumps up barking and bolts down the stairs. It's enough to stop your heart. And it happened twice before midnight. 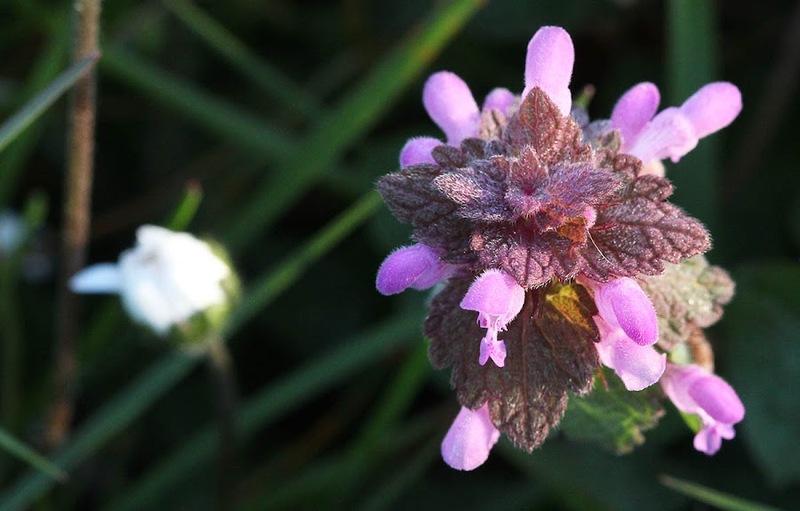 I think this is a lamier pourpre (deadnettle). They're everywhere right now. Once all that calmed down just after midnight, I could hear a dog barking in the distance. Why someone would leave a dog outside overnight, constantly barking, is beyond me. Then, just as I started to drift off, the toads in the pond out back began their very loud croaking. I finally had to shut the windows on that side of the house. It's going to take some time to get used to summer weather. But not just yet. The weather is changing and it will not be so warm, at least for a while. We're expecting cooler air to move in during the day today. The weather people keep telling us that our current weather resembles July. It's very nice for April, that is true, with high temperatures in our area in the low 20s (low to mid 70sF). Today is expected to be the warmest day this week before we plunge back into more seasonable weather, with rain. 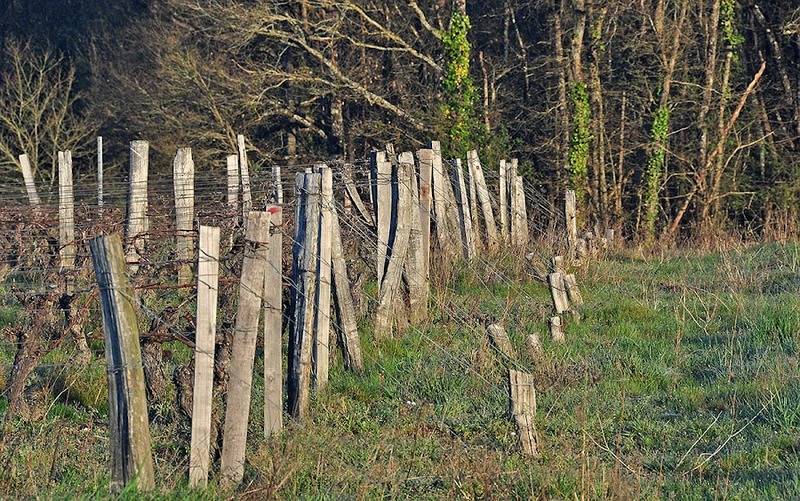 Wooden posts in the vineyard. We've been sleeping with the windows open; the loft gets warm in this weather. Night brings familiar sounds of owls and croaking toads mixed with the low hum of cars on the distant autoroute and the occasional train speeding through the valley. When I get up during the night, the sky is crystal clear and the stars are brilliant. If, indeed, July (and August) are like this, we will be lucky. It's getting there. The leaves are coming, at least the ones on the trees. It will be a while longer before the vineyards leaf out. This stretch of warm weather is helping a lot, though. The leaves are coming! The leaves are coming! And now the European clay court season is under way in Monte Carlo. Men's clay court tennis started last week with tournaments in Houston, USA, and Casablanca in Morocco. But this week they're playing dirtball on the continent, working their way toward Roland Garros in Paris at the end of May. One of the routes that Callie and I walk through the vineyards takes us past one of the old vineyard sheds, most of which are no longer used. This one has no door and is open to the elements, weeds, and wildlife. The only use it gets is as a repository for old water bottles that may or may not get used to protect new vines. 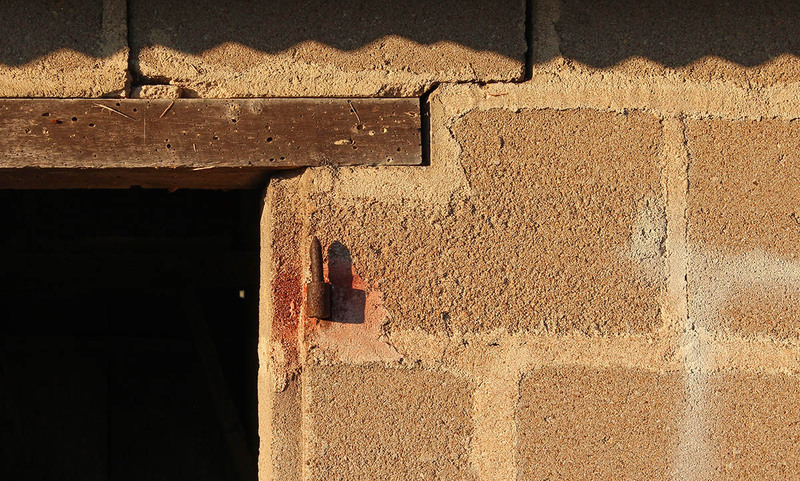 On this morning, the rising sun made shadows on the structure's concrete block wall. The pointy thing in the middle is part of the hinge where the door was. We're expecting our good weather to continue and we'll be trying to get as much done in the yard and garden as we can through the week. Callie will enjoy rolling in the grass, chasing balls, and hunting lizards. 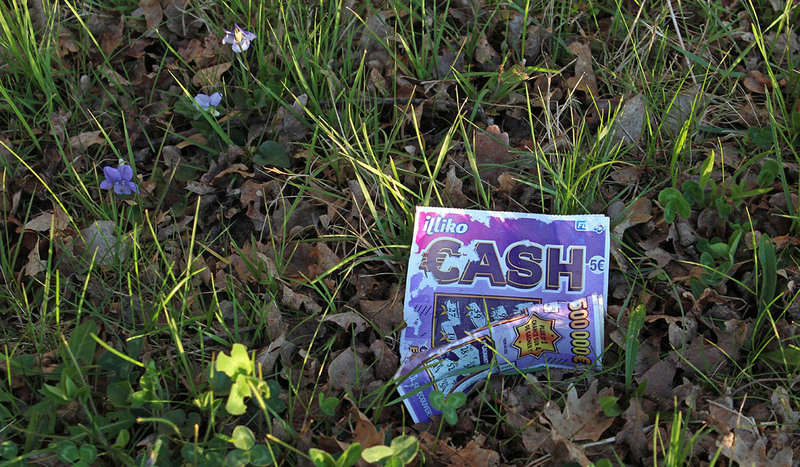 Someone's lottery scratcher did not produce a win, so it was carelessly tossed out of a car window onto the side of the road. The ticket's pretty colors will compete with the wildflowers until rain and sunlight cause it to decompose. Once again, I did not pick up this piece of litter I encountered on a recent walk with Callie. I like the flowers better. While there isn't a lot of litter around here, we do find curious things along the roads and paths from time to time. Mostly we see used shotgun shells. There is also a busted clay pigeon or two. Crumpled tissues, crushed cigarette packs, and empty beer cans show up periodically, although none in great quantity. A few times, someone used the woods as a dump for broken floor tiles, old appliances, and miscellaneous pieces of household trash (these were quickly cleaned up by the town). I remember wondering why someone would pack that stuff up and dump it in the woods when there are free dumping facilities within a few kilometers. A while back we discovered the rusted out shell of an abandoned car in the woods, all overgrown with vines and weeds. After a couple of years, it disappeared, but we have no idea who took it away. 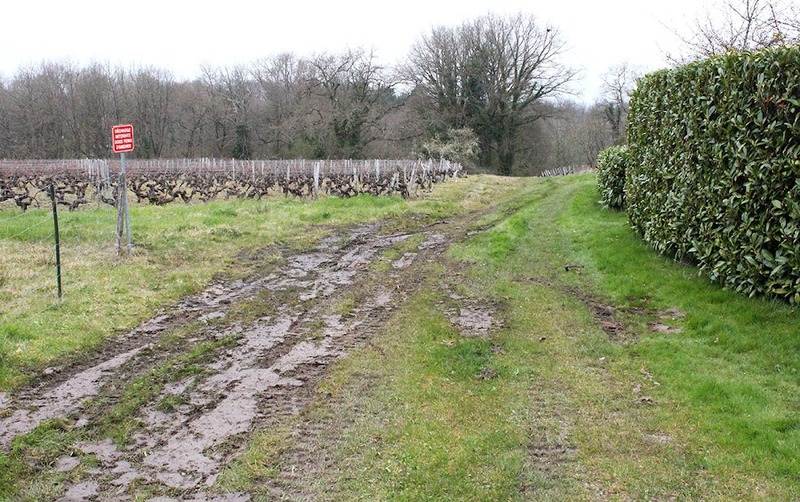 I once saw a couple of used condoms on the ground at the end of the dirt road that runs through the vineyard. Yuck. I used a stick to move them into a ditch and covered them with leaves so the dog would not get curious. Season 5 of Game of Thrones starts this month. This is among many entries in the "climate change is causing bad storms" category. Super Cyclone. American made-for-tv movie. Directed by Liz Adams, 2010. With Ming-Na Wen, Nicholas Turturro, and Andy Clemence. A massive tornado heads for the American east coast. A meteorologist and a petroleum engineer join forces to try to stop the threat. ► The special effects are mediocre, the acting is bad, and the whole story is highly unlikely. Pathetic! The pruning is nearly done in the vineyards. Here and there I can still see people pulling the cut vines off the support wires and lining them up on the ground between rows. The tractors will soon be out to grind the cut stems into mulch. It won't be long until leaves start to appear on the bare vines. It's nice to think that the whole summer is ahead of us. Of course, we're not through with spring yet. I'm getting the grass cut. It's taking longer than I thought it would for two reasons: there are more mole hills to remove than I expected and the grass has gotten very tall and thick. It's usually like this the first time each year. It's also nice to spend a little time sitting out on the deck, puttering with potted plants or just sitting watching the buds on the trees get fatter. The leaves are coming! 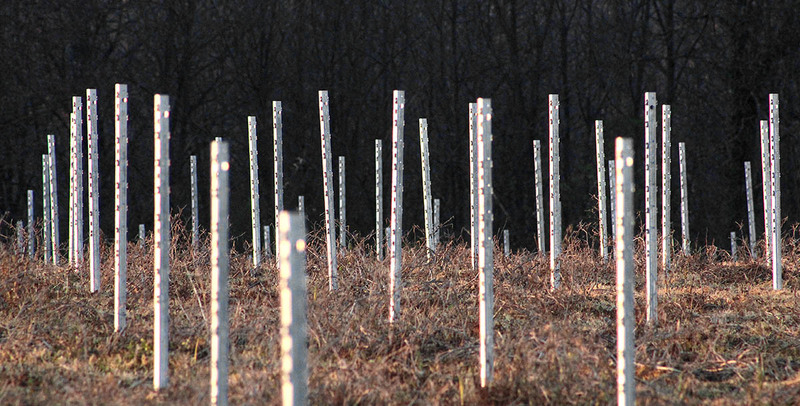 These are some of the new posts in one of the re-planted vineyard parcel out behind our hamlet. They're made of metal and should, according to what I've been told, last a lot longer than their wooden counterparts. They're not all installed yet. Once they are, I imagine that the support wires will be strung. The new vines are only about a foot tall at this point, but they will grow. They may lack the charm of wooden posts, but they're more practical. And you can hardly see them once the vines grow up, anyway. Wednesday was productive. 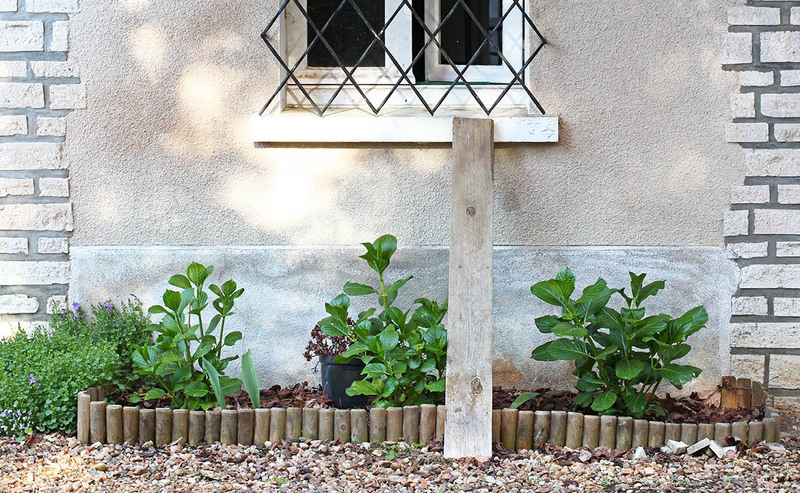 Ken washed the old Peugeot and began the process of tilling up the soil in the vegetable garden. I changed the oil and sharpened the blade on the lawnmower and power-washed the deck. We're nearly ready for summer. Today is predicted to be a very warm day, so I plan to get the grass cut after lunch. Ken will probably do some more tilling. I've always heard the expression "crazy as a loon." Apparently it derives from the strange call of the North American loon, an aquatic bird (called a "diver" in the UK). But does "looney" come from that expression? Or is it a deformation of "lunatic" which has to do with being moonstruck, driven mad by the moon as a dog might be. 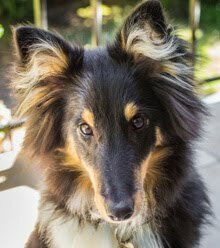 In French, an unpredictable dog is sometimes called un chien lunatique. 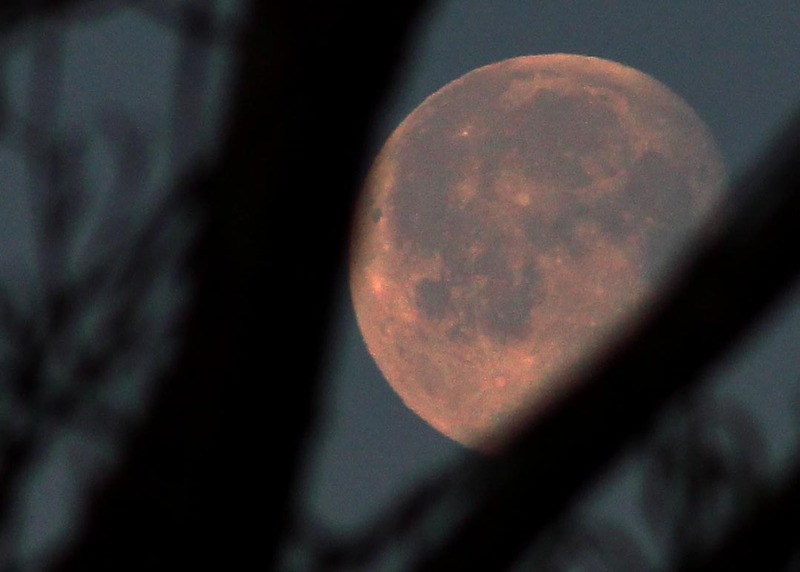 A setting moon reflects the rising sun early on Tuesday morning. In any event, our clear weather during the past few days has given us an early morning show as the setting full, now waning gibbous, moon looms in the western sky. 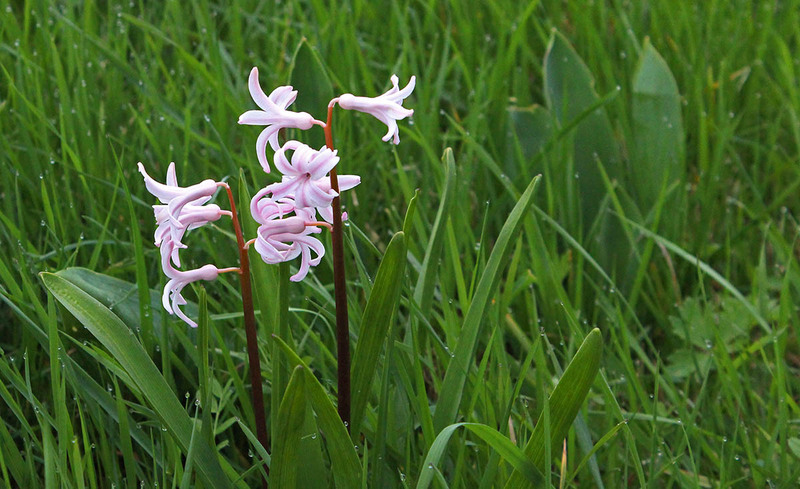 These flowers show up in the spring in a patch of grass out by the pond. To me, they look like hyacinths that have escaped from somebody's garden, but I don't really know what they are. The weather is nice and we're planning a couple of outdoor work days this week. On the list are tilling the vegetable garden plots, cutting the grass, and power-washing the deck. Spring! UPDATE: I noticed during my morning walk with Callie that, sadly, somebody (presumably an Easter holiday maker, not someone who lives here) picked these on Sunday or Monday. 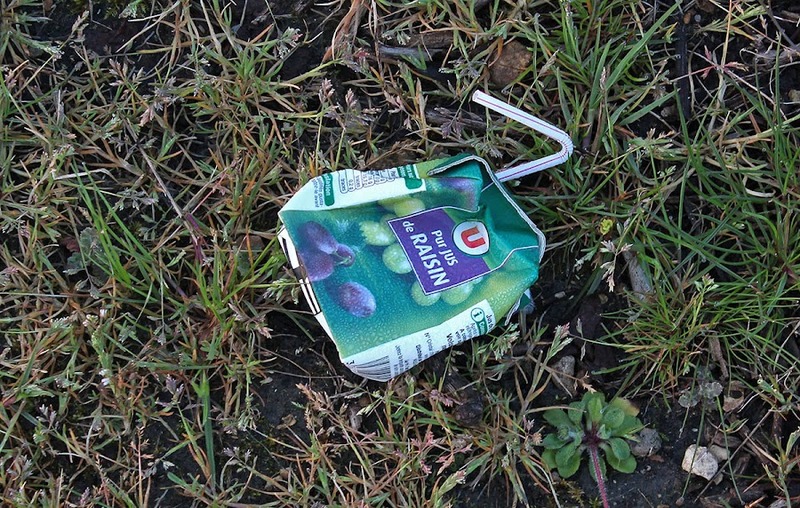 Somebody left a juice box behind in the vineyard. I took the photo, but I didn't pick up the box. I should take a little bag out with me next time. It's funny to see a box of grape juice among the grape vines. The French word for grape is raisin; what we call raisins are raisins secs (dry grapes) in French. The sun has come out again and things are drying up a little outdoors. Of course, with the clear skies, the early morning hours are chilly. But it's nice to see the sun and enjoy bright days for a change. This is what the workers left behind last week. They came to remove an electrical pole from the vineyard just to the north of our house. They parked out back and worked from there. Thankfully, they made a pass with the front-loader to fill and scrape level the ruts they had made in the muddy ground. The tractor path just outside our back gate. As spring passes and summer approaches, the grass and weeds should fill in the bare spots. The main thing for me is that I mow this spot. When the ground is uneven, I can't do that and the weeds can get tall. So this should be alright. This week sees the return (in France) of the British miniseries "Broadchurch." I watched the first season a year or so ago when it was on. Kind of soapy, kind of police-y. It was ok, but I didn't like the wrap-up. David Tennant is fun to watch (even if his accent is a bit thick), although I never saw him when he played The Doctor. And Olivia Colman was good. I haven't decided yet whether to watch this set of episodes. What's this called? In French, the title translates as "Dangers on Earth." When I looked the movie up in the IMDB, it's called "Polar Opposites" or "Deadly Shift." Whatever it's called, it doesn't seem worth watching. With Charles Shaugnessy, Tracy Nelson, and Ken Barnett. David is a scientist whose apocalyptic theories have never been accepted. Nuclear explosions slow the earth's rotation. ► The number of clichés this film racks up is almost as impressive as the disastrous acting. Nothing much going on around here right now. This weekend is Easter, a big family holiday in France. Our neighbor across the road told me last week that they were planning to be about forty people on Sunday. I'm half expecting the other neighbors (who also don't live here full time) to show up this weekend. Monday is a holiday, and schools are preparing for their two-week spring breaks coming up. 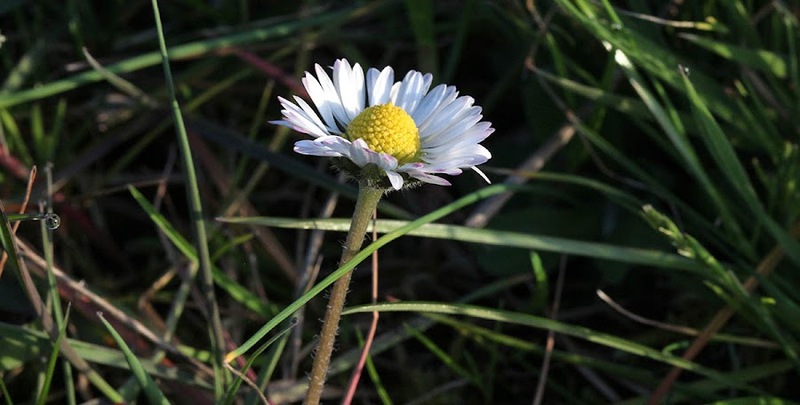 Little wild daisies (pâquerettes) are blooming all over now. I assume that their name derives from the French for Easter: pâques. On Thursday, the electric people spent most of the morning taking down the last utility pole that was left standing when the undergrounding was done last year. That pole was in the middle of a vineyard, so I suspect the crew waited until the annual pruning was done to maximize their access. The big trucks, tractor, and backhoe were parked and maneuvered outside our back gate while they worked and I was worried about them leaving big ruts in the muddy ground. But, just before they left, they used a front-loader to fill and smooth the ruts. Once the grass grows back over it, it should be okay. Maybe I'll take pictures of it this morning for posterity. How many gardeners does it take to change a bulb? The bulbs in the garden are doing their thing. Every year, when they come up, I tell myself that I should get some more to replace the tired ones and to increase the spring show. But when it comes time to buy and plant bulbs in the fall, I forget about it or, worse, forget where I wanted to plant them. 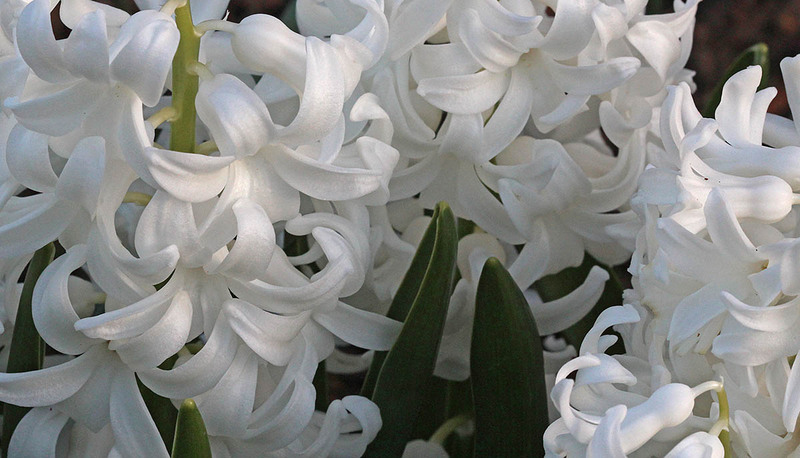 I relocated these white hyacinths ten years ago and they're doing great. I planted a little patch of tulips about ten years ago out by the driveway. Each year in recent years they've been fewer and smaller. Time to replant. At least I know where they go. Now I just have to remember to do it. I want it to be warmer, but it's only April 1, so there's little hope. Only a fool's hope. I wish I had some elaborate prank to pull, but it's not in me. Too much work. I'm watching the grass grow, waiting for a stretch of relatively dry weather. I've got to service the mower (oil, blade) and remove mole hills from the lawn before making the first pass. Any day now. 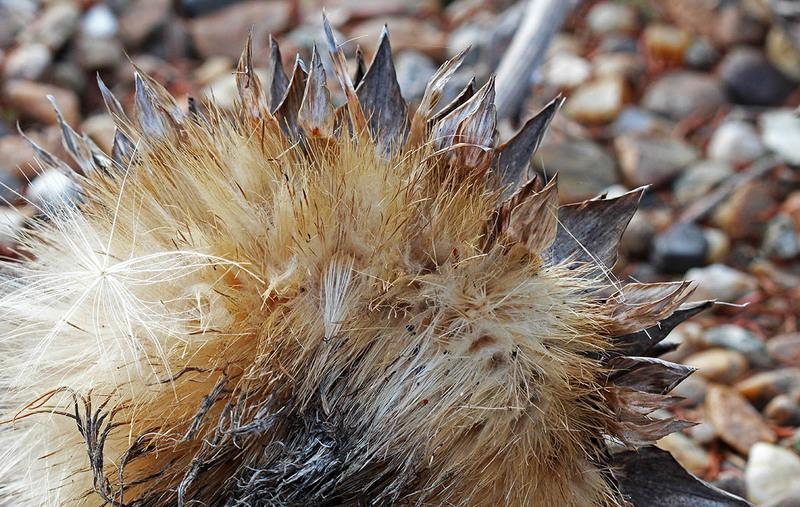 The dried artichoke flowers are releasing their hairy seeds. And there are little piles of things here and there that need to be cleaned up, like these dead artichokes on our pathway. I cut them down, but I didn't dispose of them yet. Baby steps.